Aspen Creative is dedicated to offering a wide assortment of attractive and well-priced portable lamps, kitchen pendants, vanity wall fixtures, outdoor lighting fixtures, lamp shades, and lamp accessories. We have in-house designers that follow current trends and develop cool new products to meet those trends. Aspen Creative offers a 1 pack transitional hardback empire replacement lamp shade. Made with textured fabric in grey. The lamp shade dimensions are 7" top, 23" bottom and 14" slant height. Spider construction – designed to attach to lamp harp . Applications - For table lamps, accent lamps, vintage lamps, candle stick lamps and kid's room lamps . Aspen Creative hardback shades use Virgin Styrene backing board to produce a warm, natural & smooth light – more appealing than shades made with recycled Styrene board that can crack & yellow over time. Aspen Creative offers a 1 pack transitional hardback empire replacement lamp shade. Made with textured fabric in grey. 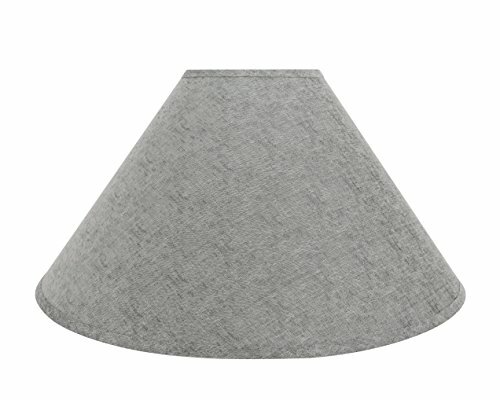 The lamp shade dimensions are 7" top, 23" bottom and 14" slant height. Spider construction – designed to attach to lamp harp . Applications - For table lamps, accent lamps, vintage lamps, candle stick lamps and kid's room lamps . Aspen Creative hardback shades use Virgin Styrene backing board to produce a warm, natural & smooth light – more appealing than shades made with recycled Styrene board that can crack & yellow over time.